Unfortunately for former Oregon quarterback Marcus Mariota his college career ended without a National Championship, as his Ducks were handily defeated by the Ohio State Buckeyes, there was nothing the All-American could do to prevent the inevitable. They were simply beat by a better team. However, his final NCAA season was not completely in vain for Mariota. In addition to being drafted second overall by the Tennessee Titans, he also managed take home a handful of individual awards, including the much sought after Heisman Trophy — something all college football players hope to one day put on their mantles. The 2015-16 season will feature both new and familiar faces. Each individual is ultimately hoping to lead their team to a championship. But they will also be looking to join Marcus Mariota in that very exclusive Heisman fraternity (not to mention the NFL). It should be stiff competition for college football’s biggest individual award. Let’s look at five players who might have a leg up on the rest of their peers. The true freshman quarterback was highly recruited out of Scottsdale, Ariz., but he didn’t begin the season as the Texas A&M starter. That role belonged to sophomore Kenny Hill. By the end of the season, though, the reigns had been handed over to Kyle Allen, and it was officially a new era in College Station. He may only have five career starts under his belt, but he steadily improved as the season’s progressed, including passing for 294 yards and 4 touchdowns in the Aggies victory in the Liberty Bowl. Kevin Sumlin is a superb coach, and has always been good at developing quarterbacks. 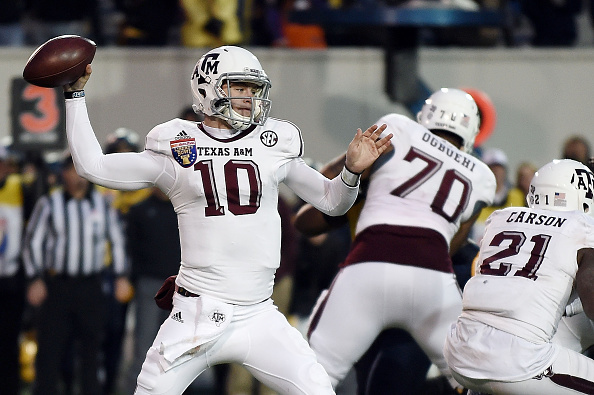 Expect Kyle Allen to put up monster numbers next year, as Texas A&M competes for a national championship. Many pundits believed that Michigan State quarterback Connor Cook might have been a first round pick if he opted to enter this year’s NFL Draft. However, the junior believes that the Spartans have some unfinished business to take of. 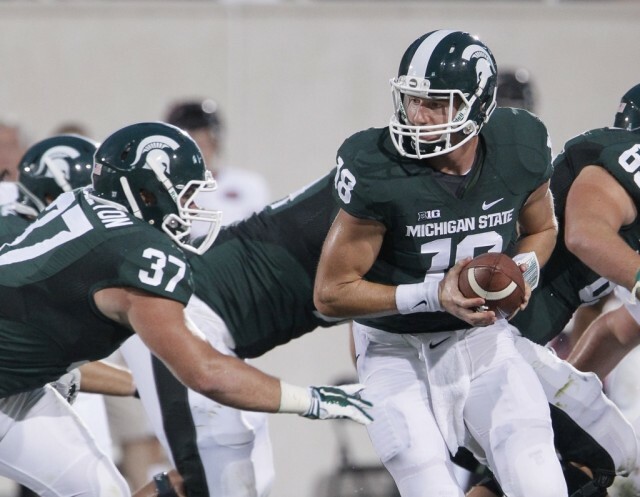 Cook had a very good year in his first full-season as Michigan State’s starter under center. He also capped off the year with an incredible comeback win against Baylor in this season’s Cotton Bowl. The thing that makes Connor Cook such a talent, is that the strong 6-4 QB rarely makes a big mistake. And, as a result, it would be a mistake to think he couldn’t take home college football’s biggest prize. 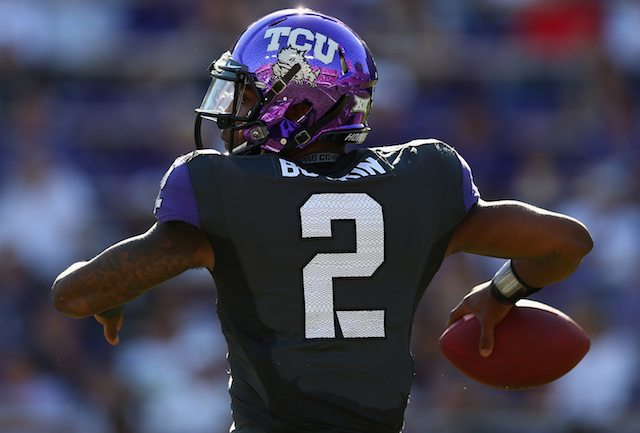 Trevone Boykin is no longer going to be able to fly under the radar. His numbers are fantastic and his team is legit. Even though they just missed out on the College Football Playoff, that didn’t stop the Horned Frogs from taking out their frustration on Ole Miss in the Chick-fil-A Peach Bowl. Boykin and TCU stomped on the blue blood our of the SEC West, 42-3. This wasn’t his best game of the season, considering he did throw three picks, but Boykin had already proved his worth by tossing seven touchdowns in a single game against Texas Tech. Look for Boykin to continue to put up monster numbers. And, if TCU vies for a national championship, Boykin should take home plenty of individual trophies, maybe even the Heisman. Even you weren’t aware of Ezekiel Elliott before the College Football Playoff, I’m sure that’s changed. In the Sugar Bowl against Alabama, Elliott exploded for 230 yards on the ground and two touchdowns. However, he saved his best stuff for the title game, running all over Oregon for 246 yards and finishing with four touchdowns. This sophomore is truly special, and was more than deserving of offensive MVP honors in the College Football Playoff National Championship game. Ohio State will look to repeat as champions next season, and with Elliott in the backfield, that just might happen. We don’t know if J.T. Barrett will be the man under center for the Buckeyes next season. At this point, they have three guys capable of leading them to victory. 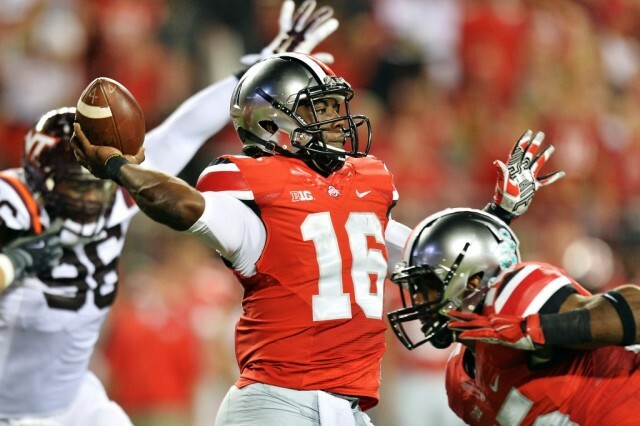 But, before he broke his ankle against Michigan, Barrett was having a record-breaking year. His athleticism is undeniable, and he proved that he could win the big games on the road. He is a true dual-threat quarterback, and is a nightmare for defensive coordinators. J.T. Barrett will be returning for his redshirt sophomore season at Ohio State. And it appears that a quarterback battle is going to take place. If J.T. Barrett ends up proving to be the guy for the Buckeyes, making a run at the Heisman should be a piece of cake.